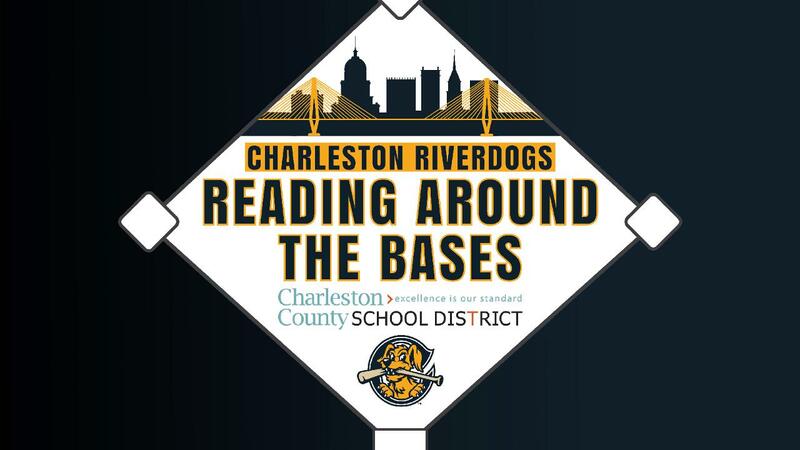 CHARLESTON, S.C. - The Charleston RiverDogs are proud to announce its joint program with the Charleston County School District, "Reading Around the Bases," is back for a third year in a row. The program began during the 2016-2017 school year as a way to encourage literacy. On Monday, January 14, 2019, 22 elementary schools throughout Charleston County will start a 10-week baseball-themed incentive program. Each student will receive a Reading Challenge packet that includes a score card, tracking sheet, and their very own personal baseball card. To move around the bases on the score card, a student must read a certain number of pages: 100 pages for a single, 200 pages for a double, 300 pages for a triple, and 500 pages for a home run. Students also earn points for their class depending on how far they advance and how many times they "round the bases" on the score card. "This effort to encourage literacy and reward our students for their accomplishments is one of the highlights of the school year," said Cindy Ambrose, CCSD's Deputy Superintendent of Learning Services. "The RiverDogs remain one of our most engaged and enthusiastic community partners. We are grateful for their support." The unofficial kickoff event for "Reading Around the Bases" this year will be at Stono Park Elementary School (at the St. Andrew's campus) in West Ashley on Wednesday, January 23, 2019 at 10:00 a.m. Media outlets are invited to attend. In addition to the program, the RiverDogs announce their annual "Education Day" games for the 2019 season. This year those games will fall on Wednesday, April 17 and Tuesday, May 28. Both games will begin at 11:05 a.m. with gates opening at 10:00 a.m. Lowcountry area schools are invited to apply for complimentary tickets to both games on a first come, first serve basis. Limited number of tickets are available for this "field trip." To apply, visit riverdogs.com or contact Charleston RiverDogs Director of Community Relations Walter Nolan-Cohn at communityrelations@riverdogs.com. The top-25 second grade students from each participating school in the Reading Around the Bases Program will be honored during the 2nd Education Day Game at The Joe at 11:05 a.m. on May 28. "The RiverDogs are excited to team up with the Charleston County School District for the third year in a row for Reading Aroundthe Bases." added RiverDogs President and General Manager Dave Echols. "As this program continues to grow, so too does the RiverDogs' eagerness to promote literacy among Lowcountry youth in a fun and interactive manner." For more information on "Reading Around the Bases," please contact Christy James, CCSD's Library and Media Services Specialist and Textbook Coordinator, at (843) 937-6300, or Walter Nolan-Cohn with the RiverDogs at (843) 723-7241. Charleston County School District (CCSD) is the second largest school system in South Carolina representing a unique blend of urban, suburban, and rural schools that span 1,000 square miles along the coast. CCSD serves more than 50,000 students in 86 schools and specialized programs. With approximately 6,100 employees district-wide, CCSD is the fourth largest employer in the region. CCSD offers a diverse, expanding portfolio of options and specialized programs, delivered through neighborhood, charter, magnet, IB (international baccalaureate), and Montessori schools, and is divided into three Learning Communities. Options include specialized programs in science, engineering and mathematics; liberal arts; music and other creative and performing arts; career and technical preparation programs; and military and other public service enterprises.